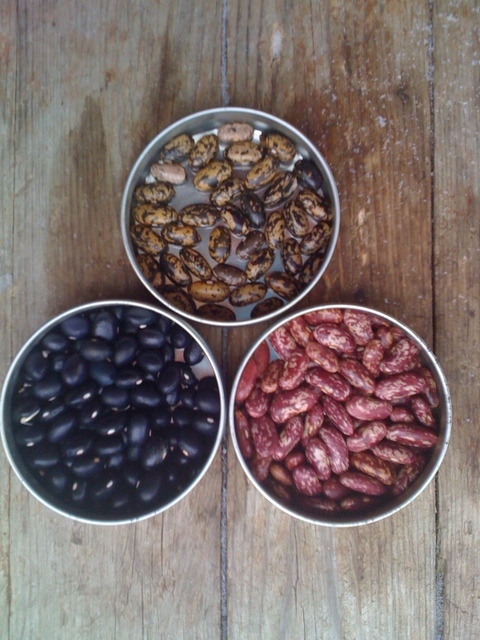 Beans at various stages of maturity from scarlet runner and other pole bean varieties. Beans have me entranced. Each year I plant ever more varieties for drying and shelling. The colors,patterns and sizes,the smooth coolness clicking through my fingers,the ease with which they grow,and the tasty and nutritious meals they create,keep me under their spell. As a teenager,I was shocked to hear my very proper grandmother recite,Beans,beans,the musical fruit / Makes your pants go tootely toot! I realize now that everyone knows that rhyme and the only thing shocking about it is that I’d never heard it before then. But whenever I recall the rhyme now,the word musical is replaced in my mind by magical. 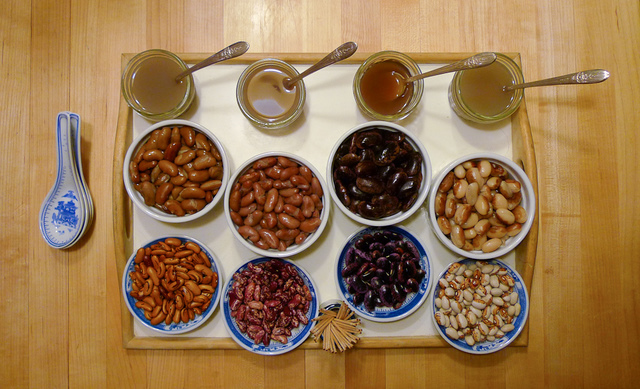 I came under the spell of dried beans a few years ago after reading Gaia’s Garden. It inspired me to begin experimenting more deliberately with polyculture,the art of growing mutually beneficial plants together. The theory suggests we mix in with our primary crops,plants that serve specific functions of enhancing plant and soil health such as those attracting beneficial insects (dill and fennel blossoms),nutrient accumulators (dandelion and comfrey),and nitrogen fixers (clovers and legumes). So I started tucking bean seeds in between the tomatoes,lettuce and using the classic native American technique of vining beans on corn. The beauty of growing beans for drying this way is that you can seed the beans in early summer and then forget about them until fall. Once brown,the whole plant with the bean pods attached can be pulled up (or cut the stem and leave he roots) and stored in a dry, airy place for a week or two before threshing. The beans appear to grow compatibly with a wide variety plants and different varieties of beans can be planted side by side. More often than not,they will form beans true to seed. This enables those us who garden intensively in limited space to have the pleasure of growing a rainbow of bean varieties. Occasionally cross pollination does occur. This summer I ended up with some attractively speckled beans –black on a tan background –that were nothing like the beans I’d planted. I’m guessing that my new bean is a cross between King of the Early and Black Coco. I’ll plant the new variety this summer and see how it grows and tastes. Perhaps it will provide a gateway into a new hobby in plant genetics. Home grown and dried beans are great in the kitchen too. Not only are they delicious but if used within a year of harvest,they cook much faster than most store-bought beans. 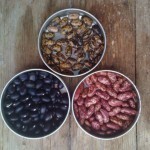 I prepared a taste test of four of my home grown bean varieties for a dinner party last week and cooked each batch separately in my pressure cooker,paying close attention to timing. In retrospect maybe the pressure cooker wasn’t the best approach. Even with the extra vigilance and drastically reduced cooking times,I nearly over-cooked all the batches. Furthermore,the beans may have been over-soaked in a misguided effort to make them as tender as possible. Achieving that perfectly cooked bean between too firm and too soft is tricky since the older and dryer the bean,the longer it needs to soak and cook so to determine the cooking time, you not only need to consider the variety but also the age of the bean. Since the beans were a little mushier than they should have been,I don’t think the taste test was a true as I’d hoped. The flavor and textural distinctions between varieties were negligible. 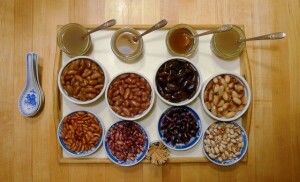 We tasted both the liquor (cooking water) and the beans. The only flavoring was salt. 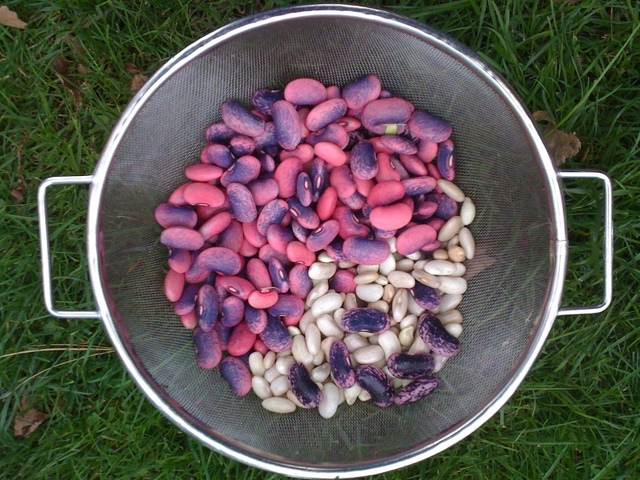 My previously identified favorite,the Hidatsa Shield Bean,did not impress our guests. I thought it had a sweet note that was lacking in the others,but the two early-ripening kidney-style beans,King of the Early and Tigers Eye,that I had dismissed as less flavorful,got surprisingly high marks. Scarlet runner beans were notable for their large size and slightly spicy flavor,especially in the richly colored liquor. The overall take-home from the tasting was nothing new –that all fresh,home-grown dry beans are quick to cook and delicious. Inexplicably,perhaps because of the beans’freshness or due to the thorough soaking and rinsing before cooking, I experienced none of the infamous bean-induced music after the tasting. Based on what I’ve learned as a bean-obsessed gardener,allow me to offer an alternative version of the bean rhyme. (I tried but couldn’t come up with a good phrase to end with astute.) If you have a better rhyme,don’t be shy. Please share it. Easy to grow and ever so cute.